Raw, extra-virgin and unprocessed Coconut Butter. 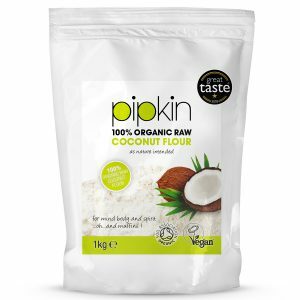 No nasty additives, Pipkin is just coconut flesh, cold-pressed and sourced from tropical Sri Lanka. 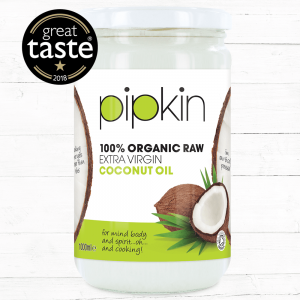 Like all things Pipkin, coconut butter is made purely from coconuts, natural unrefined and full of goodness. Our coconut butter spreads like butter, smooth and velvety. 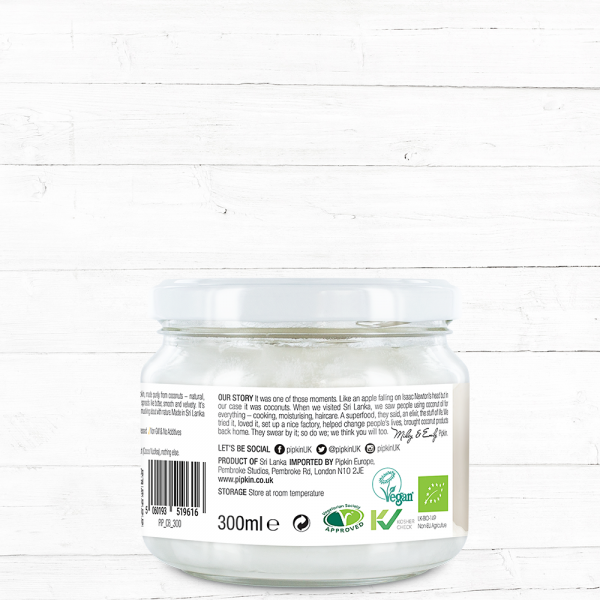 It’s made from the whole coconut including the flesh – no nasty additives, no mucking about with nature. The perfect baking dairy-free, gluten free and nut-free substitute. Use as a healthier alternative to cream cheese, peanut butter, cream, margarine and butter. 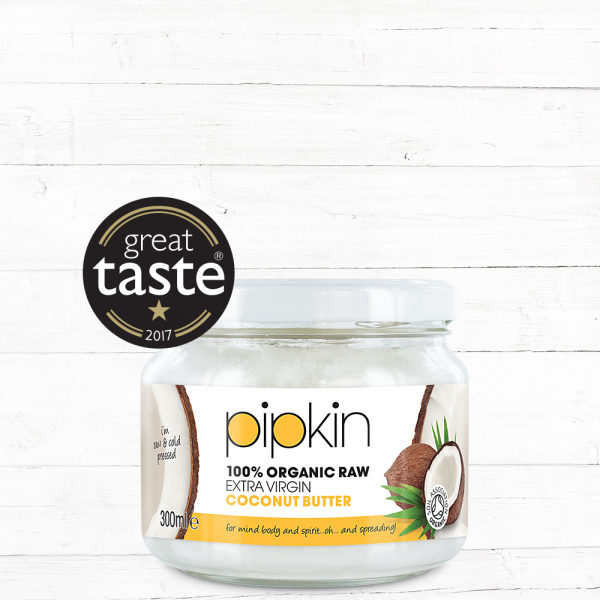 Full of flavour, Pipkin Coconut Butter is perfect for adding a little tropical taste when spread over toast, stirred into curries and baked into sweet treats. Full of healthy fats and fibre from the coconut meat, it can also be eaten on its own to curb sweet cravings! 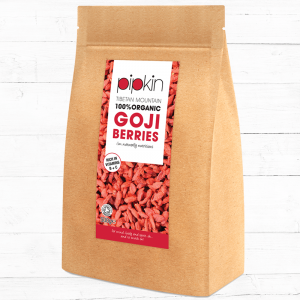 SUITABLE FOR VEGETARIANS AND VEGANS – Dairy-free, Gluten-free, Nut-free & Cholesterol Free. Made with the whole coconut including the nutritious and delicious coconut meat. 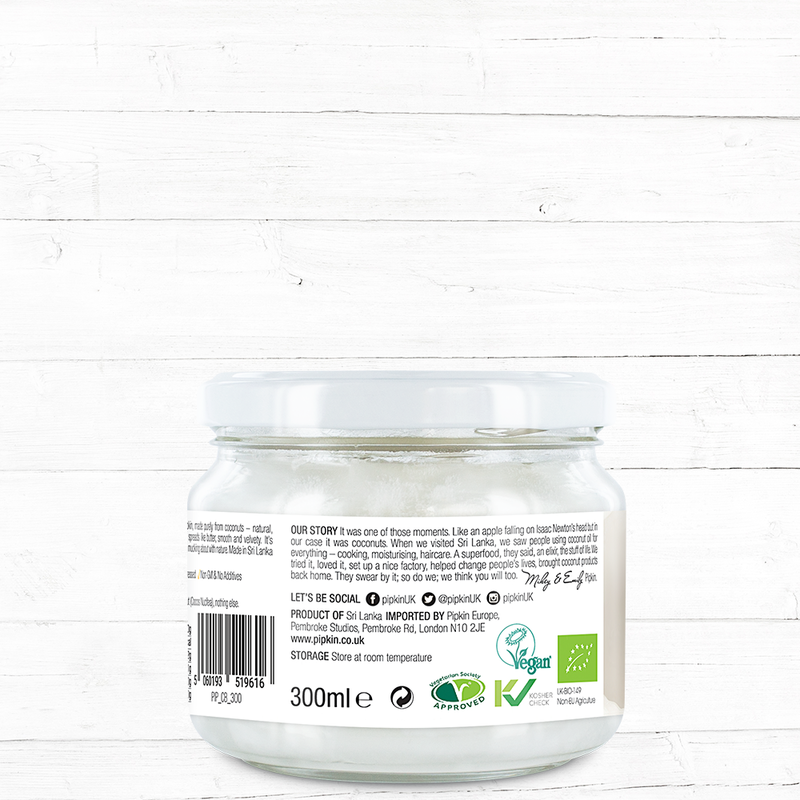 GLUTEN-FREE NATURAL REPLACEMENT for refined sugars, cream, butter & margarine. A nut-free substitute for peanut & almond butter. Perfect for baking. 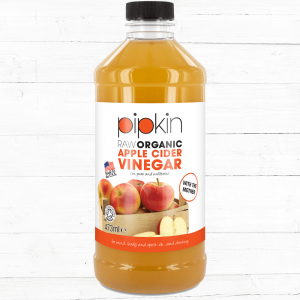 ADDS NUTRITION TO YOUR DIET – No added sugars, completely raw, natural product. One tablespoon of coconut butter provides 2 grams of fibre as well as potassium, magnesium, and iron. 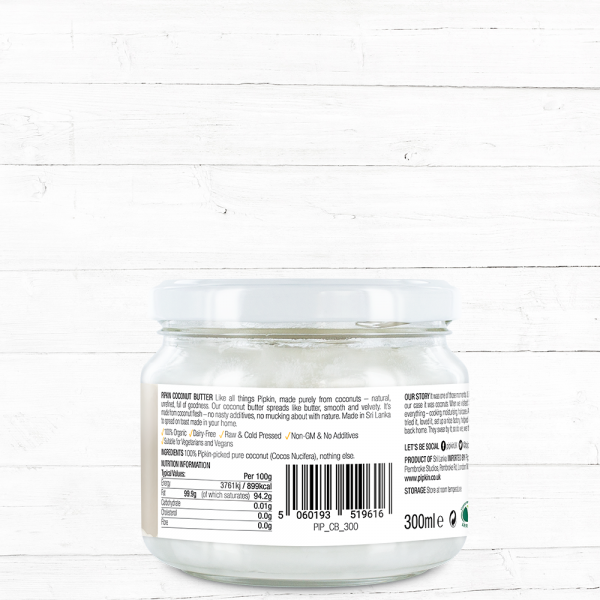 HARVESTED FROM LUSH COCONUT PLANTATIONS IN SRI LANKA – coconut sourced for its premium quality. Tastes absolutely delicious! I actually prefer this to the coconut oil.. only wish bigger packs of it were available. PS. I used the coconut butter to mix it in the food processor with a bag of roasted peanuts, some cocoa powder and honey – seriously addictive!! I wanted to say huge congrats to having a customer service team that’s second to none!! I was already excited enough to have come across your website, but then to find your incredibly competitive prices, your free delivery AND a free gift – it all seemed to good to be true. In fact, I already emailed a whole host of friends even before I’d placed my order, as I wanted to share your website and offers with them asap. What topped it all off was the fastest delivery I have ever received – I placed my order yesterday morning, and the delivery arrived this afternoon. Every item was so carefully and protectively wrapped! I’m sure you get a lot of positive e-mails, but I thought I’d add another one. Thank you so much for your 5* customer care and fab business, I know I will definitely be back to order more soon! Thought i’d try this brand of coconut butter for a change as it’s cheaper than some of the other brands in my local supermarket. I’m lactose intolerant so it’s a great substitute ingredient in my cake recipes. The coconut taste isn’t really overpowering which is good. Delivery was very fast so i’ll be buying again in future. The best coconut butter i’ve ever tasted! I love that this coconut butter has pieces of real coconut in, i’ve never seen this before with any other brand! 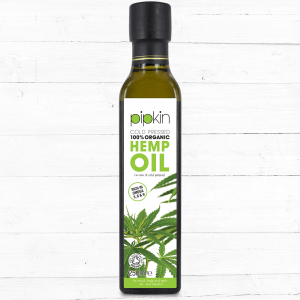 Came quickly and I cant wait to order with Pipkin agin. Tastes and smells amazing! Really impressed with the delivery, it came really quickly. 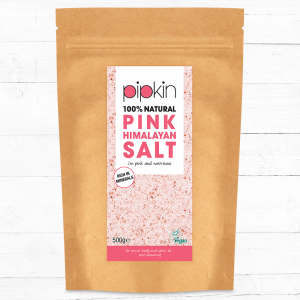 Would 100% order with Pipkin again!